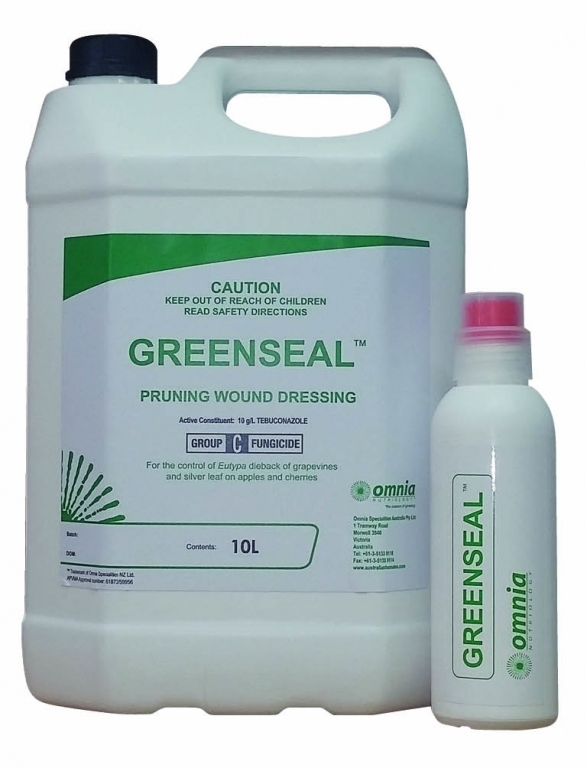 Greenseal™ is a specially developed pruning wound dressing, incorporating a fungicide Tebuconazole 10g/L, into a tough rubber like acrylic resin. The tough acrylic resin is easy to apply, UV resistant, flexible, waterproof, dries quickly and encourages callusing to ensure rapid wound closure. During pruning, grape vines are exposed to fungal infections (including Eutypa lata and the various Botryosphaeria species) that can easily gain access via the new wounds. Greenseal seals the wound but also stops the fungal infection if airborne spores have had time to infect the exposed pruning wound. Greenseal™ is easy to apply and dries quickly to seal off pruning wounds to provide protection against Eutypa Lata and Silver leaf. Eutypa Lata, known as “Dead arm Disease” is a very destructive disease of grapevines. The fungus is more prevalent where rainfall is likely to exceed 600mm p.a. Worst affected are grapevines, however the fungus will also attack pipfruit, stonefruit, poplars, willows and numerous other deciduous trees. Spores of Eutypa Lata invade the vine via pruning wounds and slowly colonize "woody" tissue. During this invasion, expect foliage to be starved of vital nutrients. Infected vines have a yellowed, stunted and distorted appearance due to various toxins growing in brown-stained wood. An invasion of woody tissue progresses, foliar symptoms become even more severe. This leads to a decline in productivity and may ultimately cause vine death. Silver leaf (Chondrostereum purpureum) is a disease that effects both stone and pip fruit trees with rapid loss of production. Silver leaf is an airborne fungal infection that spreads mainly in late winter and early spring. Fungal spores are released during rain and infect via broken branches or pruning wounds. The symptoms become more noticeable as the season progresses. Once Eutypa dieback becomes so extensive that the entire vine is compromised, vine reconstruction strategies should be seriously considered if productivity is to be restored. Be sure to apply Greenseal™ the same day as pruning cuts are made. Make clean, smooth pruning cuts with sharp pruners or saws. This helps provide a good surface for the Greenseal™ application to adhere to. Cut and train: The trunk is cut 10-20 cm below any signs of brown Eutypa staining and a new basal shoot is trained. This maintains the existing rootstock. Yield will be zero until a new vine structure becomes established. Train and cut: A healthy shoot is selected from the base of the trunk and trained up. The infected trunk is not removed until the new shoot is producing. Depending on vine structure, size of pruning wounds made and pruning regime (spur or cane pruned), application rates of Greenseal™ will vary between 2-8L per ha.